“What a passionate performance! You must be a very passionate man?” was the question (in French, oh mon Dieuâ€¦) in a radio interview during intermission in Brussels ten days ago. My answer wasn’t flattering to myself, but what do you expect me to say? “No, I am not passionate at all, rather very boring.” Well, this is what I answer when I am being asked questions like that, especially since I felt pretty empty and thus boring after the Walton performance. I had to think of this interview because today I did something seemingly very passionate: first my bow broke in the middle of the first movement of Brahms’ F-Major Sonata during my rehearsal with Steven Osborne two hours prior to our lunchtime concert at the Wigmore Hall in London, and then, within 2 minutes of our live-broadcast concert my D String broke. Passion? Or just bad luck? ?Nine years ago I had bought this gorgeous bow made by Nikolaus Kittel, the Russian “Tourte” as he has also been labeled, which broke three months afterwards. I couldn’t believe it and actually broke into tears because this bow was the first “thing” I really loved. I felt (and still do feel it) that he is the perfect alongation of my arm, and that all the music and sounds I want to create go directly from my arm through the bow into the string. Hans-Carl Schmidt in Dresden fixed it back then and it held up for 3 years, then broke again. My violinmaker in Berlin did the next few jobs, because every other year it would give in into the stress of being played every day for many hours in, yes, let’s call it a passionate way. Unfortunately in the past two months it has broken three times, and I must admit that this is getting even by my standards a bit too much. Last month I saw my luthier Ingeborg Behnke fix it with superglue, so when my Kittel broke again two weeks ago in Kansas City, I bought myself some and glued it myself. Obviously not as well as she did, because this morning it happened again. Immediately I put the superglue with which I am travelling these days (top of the check-list, even before passport!) on and continued the rehearsal on my unloved substitute bow. I ran quickly up to the greenroom where my cellocase was parked only to find it locked. Dashing back and crossing the stage to get to the room through the other stage door was unsuccesfull, also locked. The audience must have had a blast seeing the little cellist running back and fourth with his cello in a frenzy – I must have looked like straight out of a cartoon, maybe like the roadrunner? When the room got finally unlocked I luckily enough found a very last D String and put it on in world-record time (not as quick as the tire-changes in the Formula I, but close to it, I’d say unter 20 sec.) to restart the Brahms as if nothing happened. I guess only the vibrato changed, got a bit more nervous for the next few minutes but I tried to calm my left hand down while continuing the performance. It was a real treat playing in the most beautiful chambermusic hall in the world with all its tradition with my dear friend Steven, who outdid himself in both the Brahms and the Britten, getting better and better with the years, just like the two bottles of red wine we had enjoyed the night before during a delicious Indian dinnerÂ – no, not the two of us, we were four. This trip to the UK was indeed very efficient, playing two concerts in different cities with different repertoire, being away from home three nights only! On Friday I had flown to Manchester to rehearse the Dvorak Concerto with the BBC Philharmonic and young Spaniard Pablo Heras-Casado at 2 pm. My flight’s arrival time was 12:10 pm, but due to some technical problems we touched down at 1:20 pm! But either I am cold fish, arrogant or indeed not passionate enough – I really didn’t get nervous sitting in the taxi and being fully aware of the fact that I might not get to the rehearsal with one of the top British orchestras in time. But without raising my heartbeat I knocked the conductors room at exactly 1:58 pm, just in time to tell him that I like the Dvorak with a rather classical approach, no waiting at bar lines etc. and off we went. Maybe I didn’t get nervous in the taxi, but it was indeed a very ugly feeling not having warmed up. My hands got very quickly very tired during the rehearsal and I felt bad for not playing as well as the orchestra deserves, because they were in high form and Pablo was lovely to work with. It’s always exciting to meet young new conductors from different back-grounds, him being an authentically informed singer, conducting already rather prestigious concerts. The concert went much better than this first rehersal, especially after we were fed the night before in the garden of the orchestra’s boss Richard Wrigley some delicious clay-oven-made pizza (he is a hobby chef) – and in my suitcase I am carrying clay-oven made sourdough bread Richard gave all his guests as a farewell present. Hi Alban, I know it isn’t nice to say – but I’m glad these things happen to someone else too! I saw this, because this summer I was playing in the festival of St.Lizier on the spanish border and I had the same kind of experience as your string breaking ….. Flying from Vienna to Toulouse, I had packed my spare strings in my suitcase so not to have any problems at the airport scanner (it happened to me in NY), and arriving the morning of the concert. I left my suitcase in the hotel and went quickly to the hall to rehearse, not thinking about taking the spare strings. So, a quick return to the hotel to change and I came back to play the concert, a little stressed and feeling under pressure for the hellish acoustic of the hall along with the heat of the summer, forgetting completely to take out the spare strings and along to the concert with me. Opening the 9pm start with Dutilleux 3 strophes, I managed to snap my A string on the pizzicato chord of the last line… So, no problem I thought, as I finished up the D string and walked calmly backstage to put on my spare string. And reaching into the pocket of my case my heart skipped a beat as I discovered my strings weren’t there. And therefore I got into a car and was driven at high speed back to the hotel, whilst my pianist entertained the waiting public with parts of his solo programme for the next night in Paris (what joy it is to have such a wonderful chamber partners), whilst I was changing the string in the car on the way back, and walking straight out of the car onto the stage to launch into Brahms F to finish off the first half of the concert. I first heard you play the highly acclaimed world premiere at the BBC Proms of the Cello Concerto by Unsuk Chin. Unfortunately, I was not in the Royal Albert Hall but listened later on BBC Radio Listen Again. 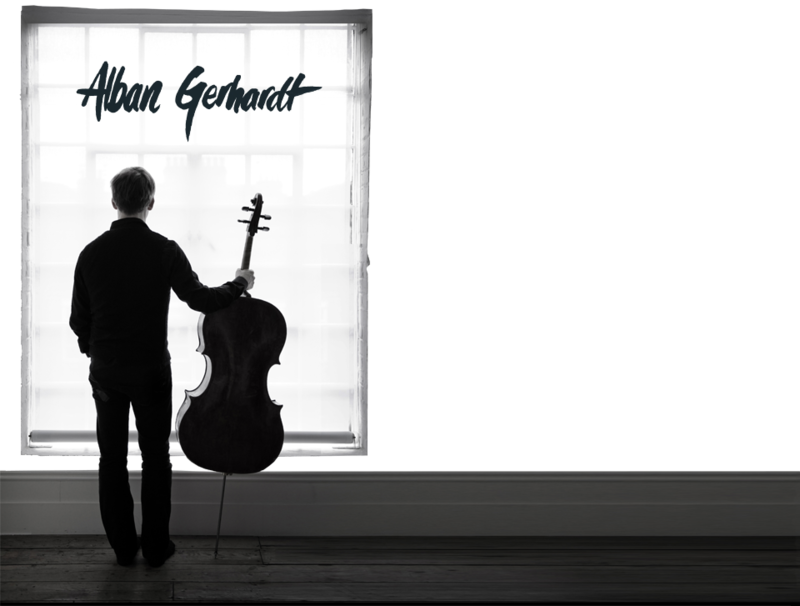 As soon as the concert finished, I scribbled down your name wrongly as Alban Gernhart to check out your work. I like two instruments in particular: percussion and cello. Finally, here was a cellist whom i could admire… (excuse my late discovery!) I cried when Christopher van Kampen died suddenly as i heard him play so many times at the Barbican and the Wigmore Halls. I could not believe my luck when i noticed that you were performing at the latter a few weeks later. Needless to say that i was there and enjoyed every second of the passionate performance. Yes, that is what i call a passionate performance – from cellist and pianist – absolutely delightful! Yes, the snapped string was somewhat unlucky but the way you handled it with such great humour was a revelation. The disappearing through the two doors was so comical, it could not have been bettered by comedians! But, hey, we got to hear the intro twice and, as you said, it helped you meet the allocated live broadcasting time slot to perfection. The concert is still available on BBC 3 Listen Again – of course i have listened to it again many times already. Unfortunately your BBC Proms Cello Concerto by Unsuk Chin is no longer available to listen to but i live in hope that you will record this as it was simply sublime. Best wishes and good luck with all instrument parts. Hi ABC, no, I am not really a Formula I fan, but since I am in general interested in sports, I hear even the news from motorsports once in a while… 🙂 No date for the Philippines yet, but as soon as they ask me, I’ll consider it, because the food was just too good to be true! We will try to see you next year June (5th?) in Cleveland, if that is still on. Severance Hall is in my humble opinion one of the most georgeous concert halls in existance. My (Rainer’s) love affair with the Cleveland Orchestra goes back to 1977 in New York, when they played alle Beethoven sinfonien und Emil Gilels die 5 Klavierkonzerte. Der damalige Konzertmeister Daniel Majeske (leider+) spielte eine golden period-Stradivari und Franklin Cohen die Klarinette von einem anderen Stern. Der ist Ã¼brigens immer noch dabei. Also : Saiten und Bogenbruch aber nicht Hals- und Beinbruch!